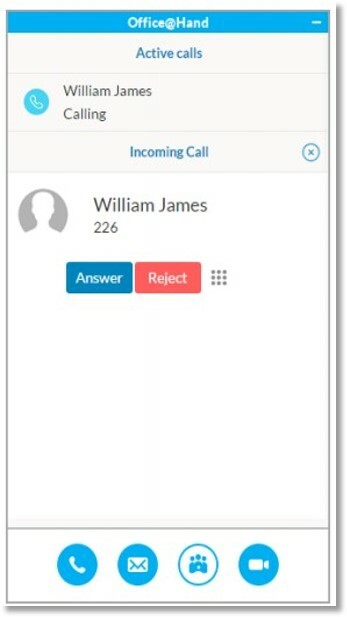 AT&T Office@Hand Skype for Business app allows you to make and receive Office@Hand calls, send and receive SMS texts, initiate Office@Hand online meetings and audio conferences. Follow the steps below to learn more about making and accepting calls on the Office@Hand app for Skype for Business. When an incoming call arrives, you can Answer or Reject directly from the AT&T Office@Hand for Skype for Business app. When you answer a call, you have the option to Mute, Hangup, Transfer, Flip, Record, or put the call on Hold. AT&T Office@Hand for Skype for Business also allows you to deal with multiple calls at the same time. If you are on a call and a new call arrives, your current call with be automatically put on hold when you answer the new call. You can easily switch among calls within the AT&T Office@Hand app for Skype for Business. 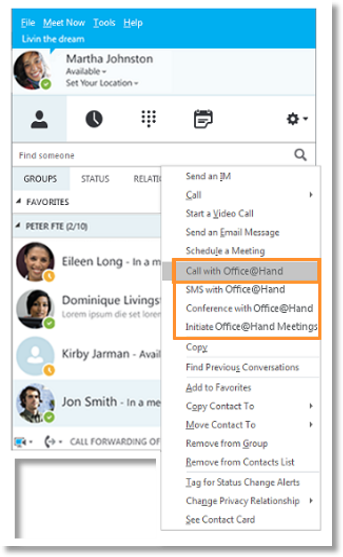 You can access this feature either from the Office@Hand for Skype for Business app Call tab directly, or from the Call with Office@Hand option from the Skype for Business contact menu. 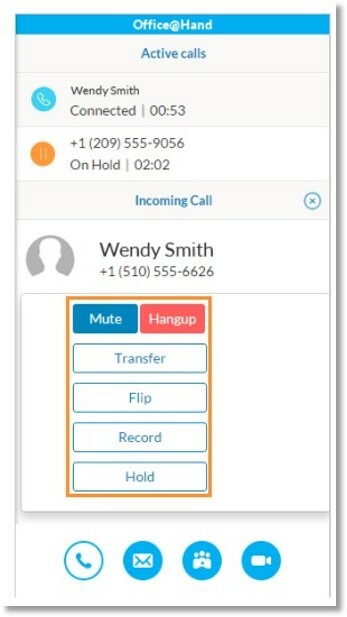 If you right-click on a Skype for Business contact and select Call with Office@Hand, the contact’s phone numbers saved in Office@Hand and Skype for Business will be populated in the drop-down below the To field in the Office@Hand for Skype for Business app. Note: If you have no access to the Call feature, you will see an error message about having no access to the feature.